Home TRICK&TIPS How do I recover deleted messages on Whatsapp? How do I recover deleted messages on Whatsapp? How do I recover deleted messages? WhatsApp automatically backs up your chats every night. You can initiate a restoration by simply uninstalling and reinstalling WhatsApp. Click Restore when prompted to restore your message history. Your missing chats should appear in WhatsApp! WhatsApp automatically makes backups every day at 4 AM and stores them in the WhatsApp folder of your Android phone. This folder is either located in your device's internal memory or external microSD card. To restore the most recent backup, you will need to uninstall and reinstall WhatsApp. 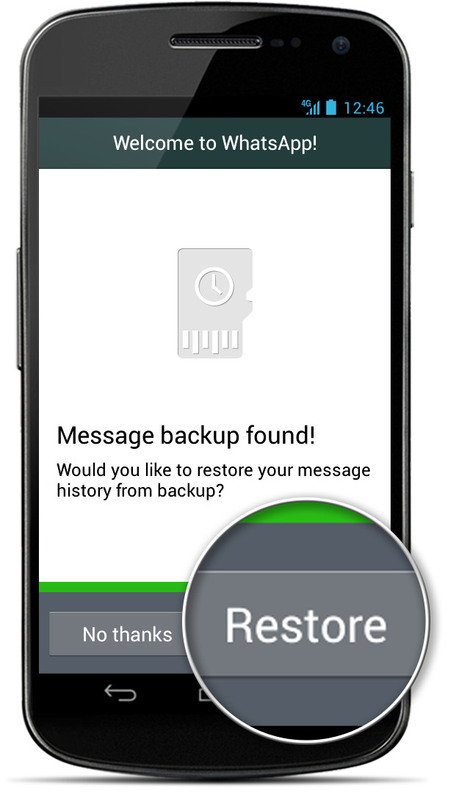 If you need to restore older messages, check out "Restoring older (less recent) backups". During the installation process, you will be prompted to restore your message history. Choose Restore to restore your missing chats. Your SD card and/or chat history is corrupted. Your backup is too old. WhatsApp cannot restore backups that are too old. You have a different phone number than when you backed up your chats. In any of these cases, there is no way for us to restore the messages for you. Current chat history will be lost upon restoration. There are only up to 7 days worth of backup files. Any new messages sent/received after a backup, and deleted before the next backup, cannot be restored. If you run a manual backup, it will overwrite the most recent automatic backup file. On newer devices, your WhatsApp/Databases folder is most likely located in your device's internal memory. You must have the same phone number in WhatsApp that you had when you backed up your chats. Make sure you have a file manager. This will be useful for renaming the backup files. Here are some choices: File Managers and Explorers. WhatsApp > Menu Button > Settings > Chat Settings > Back up chats. This manual backup file will be saved as "msgstore.db.crypt7" or "msgstore.db.crypt8" in your /sdcard/WhatsApp/Databases folder. Save this file as "msgstore.db.crypt7.current" or "msgstore.db.crypt8.current" (depending on the original file extension) so you do not get it confused with other backup files during the restoration process. Please note: your backup files are saved in the /sdcard/WhatsApp/Databases folder. This folder may be located in either your device's internal memory or external memory. Decide which backup file you want to restore. Rename that file from "msgstore-YYYY-MM-DD.1.db.crypt7" to "msgstore.db.crypt7" or from "msgstore-YYYY-MM-DD.1.db.crypt8" to "msgstore.db.crypt8". When asked to restore, tap Restore. You will now be able to see your restored messages. If you want to revert the restoration, simply change the backup filename back to what it was, rename "msgstore.db.crypt7.current" to "msgstore.db.crypt7" or "msgstore.db.crypt8.current" to "msgstore.db.crypt8", and follow these steps again.